Today after work I decided to explore the Taylor Creek Ravine, one of several deep ravines in Toronto. These areas are undeveloped for flood prevention reasons and some of them can be quite wild. I took a side path and ended up a bit lost. I was unwilling to bushwhack up the side of the ravine into some rich person's yard, so I kept searching for a trail. Eventually (2 hours later) I found my way back up to the top, where I got on a bus which took me to the subway towards home. I enjoyed the hike and took several photos. 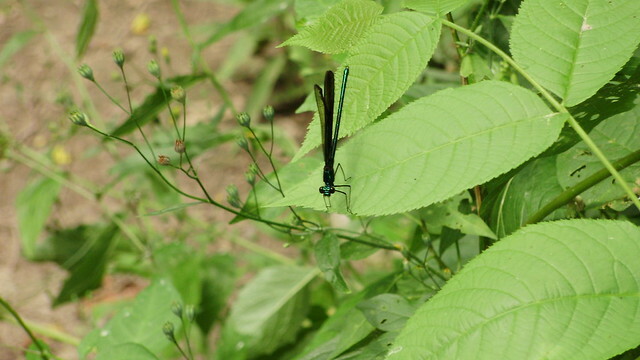 It really seemed as if one particular dragonfly were posing for me! Click on the image below to see more pictures! “Officer Bubbles” » « long live paper and scissors!